Worship Central, a ministry birthed out of London, U.K., and featuring singer-songwriters Tim Hughes, Luke Hellebronth and Ben Cantelon, this new album from some of worship music’s most underrated artists from across the pond has become one of my favourite live albums of late, in a similar musical vein to that of Passion or Hillsong earlier on during the year. With the annual offerings of these two aforementioned worship movements (and others like Bethel, Jesus Culture and Planetshakers), the culture of worship music has been continuously changing and evolving to bring about new songs and a fresh way in worshipping the Lord. Incorporating the style of worship mixed with electronic dance, Tim Hughes and co. have delivered a poignant 14 track set full of high energy and tranquil moments that remind us what it means to both bring a rousing shout of praise to God but also worship through moments of solliloquy and solace. From the anthemic first track “The Way” to spontenous melodies “All That I Am” and “Wide Open Space”, this is an album not to be missed if you are a fan of British music, worship music, or both. Starting off the album with rousing anthem “The Way”, Tim Hughes reminds us why he is still one of British worship music’s most powerful, emotive and talented singer/songwriters, even if he has been on a hiatus of late (his last album he released was Love Shine Through in 2011). Similar musically to “Let It Be Known” released last year, “The Way” encourages us to realise that Jesus is the way, and the only way for us to be brought from shame to freedom and from hopelessness to rejoicing. Electronic worship music seems to be a trend these days, and Worship Central has indeed shown us the best of what this musical genre can offer in this song. As Tim cries out ‘…You are the way, lost and dead but Your love came to find me, Jesus You are the way…’, we are able to declare alongside him in what I reckon is one of my favourite worship songs of the year so far! Well done Tim and the rest of Worship Central for offering up this melody and continuing to remind us that some of the best and often underrated worship music comes from countries and places that isn’t necessarily the U.S.. While Tim Hughes is quite possibly the most famous worship leader in Worship Central, and quite possibly the only worship artist people would know if they were to purchase a WC record, other artists like Ben Cantelon and Luke Hellebronth are just as talented, and while not as popular as Tim, nevertheless deliver some stirring anthems on Set Apart that will further enhance their popularity amongst listeners in the future. “Stand Up”, sung by Luke, brings about a melody about us looking forward to seeing ‘…history behind us, and destiny before us, every heart is bowed down…’, as a message of hope is portrayed as we move forward into what Christ has set before us. As Luke invites us all to stand up and proclaim His name, this melody is a great reminder for us to take a stand for things that matter in our lives and not focus our time on things that don’t challenge the status quo. “Worth It All”, originally written and recorded by Ben and made famous by Meredith Andrews on her 2013 album of the same name, is also an encouraging song about God being worth everything we could muster up by ourselves. We are shown the poignant truth to let go of the temporary and cling onto the eternal in the words of how when ‘…I finally reach the end I’ll say “You are worth it all”…’, and with Ben singing with the same enthusiasm and passion as Meredith, this melody is one of my favourites on Set Apart. While Tim hasn’t released any new material in the form of an album since 2011, his songwriting and worship songs are still exquisite. 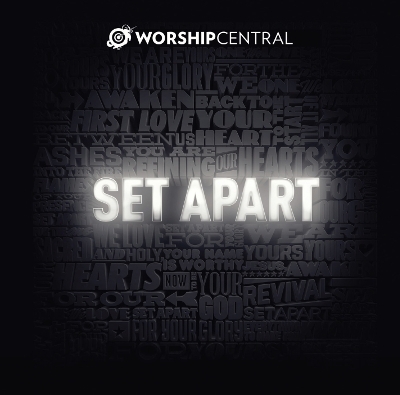 Title track “Set Apart” is a reflective 6 minute anthem that encourages us all to make a conscious choice to be ‘…set apart for our God above, set apart for the One we love, set apart for Your glory…’, and while a tad on the long-ish side and feeling Hillsong-esque at times, Tim still manages to bring forth a new song of praise in one of the standout performances on the album. Tim also leads the spontaneous “All That I Am”, a song borne out of a realisation that ‘…all that I am, all that I have is Yours…’ and that out of this we are free to not hold onto temporary things but focus more on where God is leading each of us in our daily lives, while 3 minute “Let Go” is “Joy in this Place” Pt 2 as this rousing electric guitar prominent melody brings the theme of letting go and letting joy take over to the front and centre of not only this song but throughout the album as a whole. Newcomers Anna Hellebronth (wife of Luke) and Karen Gillespie deliver stirring anthems “Awesome Is He” and “Singing Over Us”, with both melodies encouraging us to lift God up as we realise how awesome He is and understand that in all circumstances, God is singing His song over us in whatever way it may look like (and while it may not necessarily look like what we assume or want, God’s plans are always good), while last track “Wide Open Space” invites Tim once again to faciliate a free worship session as we travel to wide open spaces to allow God’s presence to flood over us and speak to us what He longs for us to hear. The piano led “Can’t Stop Your Love” brings to the fold Jason Ingram as a songwriter as Ben Cantelon leads a melody that brings the greatest encouragement to a listener- that nothing that we do or say can stop God’s love from flowing from Himself to every aspect and facet of our lives we lead. Ben also imparts to us “Dead Things to Life” and “Enough Light”, both showing us the prevalent theme of relying on God- seeing Him bring dead things to life and trusting that what He does in the lives of others can be replicated in ours (“Dead Things to Life”), as well as trusting God with each step of our lives as He shows us ‘…enough light for the next step…enough light for the way ahead…’ (“Enough Light”) while Luke invites us to accept the fact that “…though I’m unworthy, You pursue me…’ (“Pursue Me”) and realise that, through electric guitars and a fast anthem, that Jesus on the cross and His resurrection was and still is enough for us to enter in communion with Him! Set Apart, the follow-up to Let It Be Known, is a great album to listen to if you are a fan of Worship Central and their plethora of albums, or a fan of British music, or just worship music in general. While Tim hasn’t been active of late (in terms of releasing full albums), his role in building up Worship Central as being a great source of new worship song material is enough to purchase this album and listen to great new songs that rival live albums from Bethel, Passion and Hillsong this year. From the title track to the familiar and ever-reliable “Worth It All” and the poignant and emotive “Awesome is He”, the team in London have created an album that’s certainly going to be on repeat on my iTunes in weeks and months to come. Well done Tim and co. for such an encouraging and uplifiting album! Previous Post23 BlastNext PostSentimental Saturdays: Travelling Overseas, and Appreciating the Many Cultures Of Countries Around The World! Enjoy, and be sure to pick up the album next week at any digital retailer.